Have you recently been hunting for that elusive perfect pair of in ear monitors? Yes, the ordinary earbuds simply don’t cut it when it comes to isolating the noise around you. You’ve probably realized that the snare and the cymbals are just too loud, so you have to compensate by cranking up the volume in your earbuds until your ears bleed. This is where in ear monitors hit the stage, as you get near perfect isolation of outside noises. And, you can still enjoy a nice mix of your band without having to experience tinnitus for days after a gig. They’ve also become quite popular lately just for listening to music. The best in ear monitors for drummers will not only keep you from going deaf but also improve your playing as they will improve your technique and coordination - because you can finally hear what you’re playing without blaring it through a pair of incapable earbuds. Here are a handful of products that you might find interesting because I’ve spent quite some time fiddling around and finding what would work best for my fellow musicians. Check out my reviews below for 9 most suitable in ear monitors for drummers out there. Let’s start off with one of the most well established models available on the market, coming from one of the most reputable manufacturers when microphones and headphones are concerned. These babies were derived from Shure’s much more expensive models, road tested and developed with professional musicians from all genres of music. Compared to other products, the SE215 is fairly competitively priced and it’s quite fair to say that you get quite a lot of bang for your bucks. Unlike most of its competitors, Shure relies on a good old Single Dynamic Driver for the delivery of sound into your ears. The amount of bass frequencies delivered from such a small package is quite respectable. As far as noise insulation is concerned, the SE215 block out any noise up to the 37 dB mark. If you’re not playing in packed stadiums these in ear monitors will live up to your expectations. There are three different sizes of flexible foam sleeves to choose from, and generally speaking these are some of the best IEMs for drummers as far as comfort is concerned. The SE215 comes in 5 optional finishes: clear, white, blue, blue/gray, and black. Quite a newcomer on the market, MEE Audio makes good products at a fraction of the price of their competitors without compromising sound quality. At first glance, these babies look really handsome, and the clear finish makes it easy to take a look inside and check out all the intricate circuitry in charge of delivering the sound to your ears. By the way, the M6 Pro is also available in black. The package you get for the price is quite a hefty one. You get two cables, one of which is equipped with a microphone and a remote control. Both cables are detachable, which is another nice touch in terms of durability and longevity. There are SEVEN different ear tips to choose from - six made from silicone and one made from foam, so you’ll really be able to find the most comfortable combo for your ears. On the other hand, the sound of these in ear monitors may not quite live up to the expectations based on the design and visual features. The M6 Pro is quite good with reproducing bass frequencies, but the higher treble range sounds a bit mellow, especially if you like getting some cymbals in your in ear monitor mix. But then again, it's decent enough considering the cost. Now we’re getting to more serious stuff. If you’re playing drums just for fun or simply want a neat pair of in ear headphones for your mp3 collection, these are probably out of your reach as they are quite pricey. But, it will all make sense once you try these on. The first thing you’ll notice is that the design and the fit is nothing short of perfect. There are ten silicone and ten foam ear tips to choose from. Once you find the ones that conform to your ears or suit your preferences, you’ll be greeted by 124dB of sensitivity at 1mW. How’s that for the ability to play loud with little power? Also, you can wear these for hours without ever experiencing any fatigue around your ears. When we’re talking sound reproduction, these babies can really deliver, and then some. Remember Shure’s in ear monitors and their single dynamic driver? Well, these come equipped with three different sound drivers - one for high frequencies, one for the midrange, and another separate one for the bass. These can’t really punch you in the behind like a huge pair of monitors can, but you’ll definitely dig the way the UM Pro 30 makes your band sound in your separate mix. Another contender from the lower budget part of the market, the Bsinger+ Pro is aimed at those who need their in ear monitors to look really good. These are among the prettiest in ear monitors available, featuring a neat see-through plastic casing which shows off the circuitry inside. The cables included are hand woven and plated with silver, and, of course, they’re detachable. One comes with a remote and a microphone. Included in the package are a neat carrying case and five different ear tips to choose from. While these in ear monitors aren’t among the most comfortable of the bunch featured here, they sure look nice. Just looking at the price tag, you’ll know that you shouldn’t really expect miraculous sound coming out of them, but it sure is nice that they come equipped with two separate sound drivers, one for higher and one for lower frequencies. If you haven’t had any experience with in ear monitors and you don’t want to break the bank before deciding if you can actually play onstage with such a system, these may just be the right ticket for you. Moving back to the pricier end of the in ear monitor market, the ATH-IM02 comes from another reputable maker of audio products. When all things are considered, this model doesn’t break any new ground, but is loaded with all the features that make it the best higher-end pick of the bunch. When compared to its similarly priced rivals, the ATH-IM02 shines much brighter, as it features two separate sound drivers instead of one. 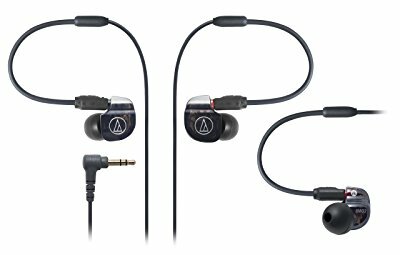 While you’re reading this article, you’ve surely become a bit spoiled for choice, so you’ll probably be a bit disappointed that the Audio-Technica only has four different ear tips for you to choose from, especially at this price range. But rest assured that these are quite comfortable, even after wearing them for a few hours. The cable included is detachable, which is a nice touch. 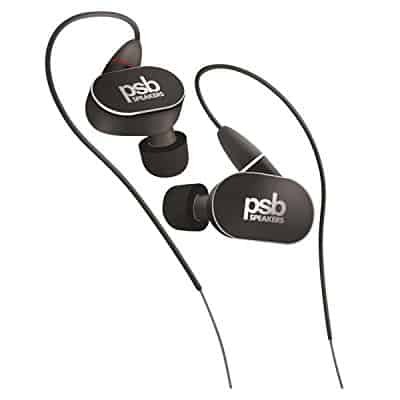 Where sound reproduction is concerned, these in ear monitors will not disappoint, whether you’re craving insanely low bass or the most precise high frequencies. It’s fairly easy to say that these are probably the ones you should consider if money’s no object. 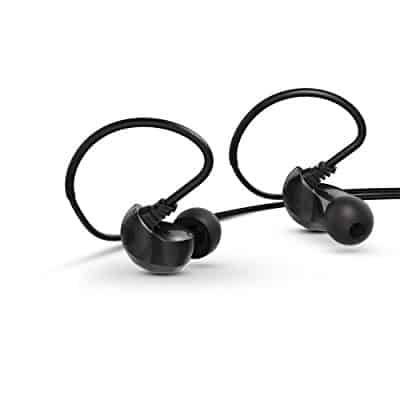 The Brainwavz B150 has made quite an impact on the market for in ear monitors, as it packs quite a punch in terms of features and sound quality, especially if you consider the relatively low pricing. The B150 features a balanced armature, but only one sound driver for the entire frequency spectrum. Right out of the box, the design doesn’t promise much, as they’re all black, but in terms of ergonomics they offer a lot, as the B150s are quite comfortable. The package includes six different silicone ear tips to choose from, so it’s fairly safe to say that they’re going to fit any pair of ears. The build quality is just about average for the price tag. Another thing I didn’t like is that the cable isn’t detachable. Moving on to the most important part of the review, the sound reproduction quality is surprisingly good, probably due to the balanced armature and in spite of the fact that there are no multiple sound drivers. The rated sensitivity of 105 dB at 1mW is quite common for in ear monitors of its class. Once you get past the uninspiring product name and code, you’ll be greeted by quite an honest pair of in ear monitors. And if you dig further, you’d discover that PSB is a respected Canadian manufacturer of audiophile speakers. Even though the design comes off as a bit too chunky, this is probably the best value for money here. It may not offer the niceties of the more expensive models on the list, but the PSB M4U-4 features a dual sound driver system. As you’ve probably expected, the buds come with two detachable cables, one of which features a microphone and a remote control. There are six different ear tips to choose from, three foam and three silicone ones, and the overall feeling of comfort is quite a satisfying one. One minor design flaw is reflected in the fact that the only way to discern the left from the right headphone is by checking the color trim around the cable connections. This isn’t good for dimly lighted stage acts. As far as the sound quality is concerned, there really isn’t much to complain about, although some people with a thing for refined treble reproduction may find these to be a little bit too harsh. 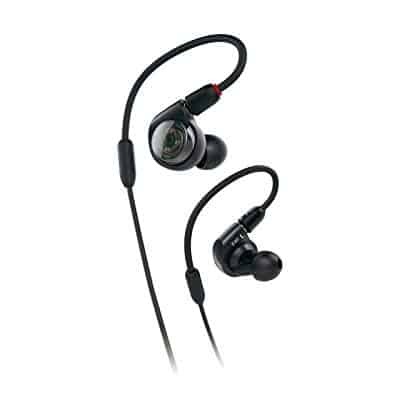 Audio-Technica’s ATH-E40 earphones have a modern design which adheres to the philosophy of functionality over form. These quality IEMs offer great performance for their price class. 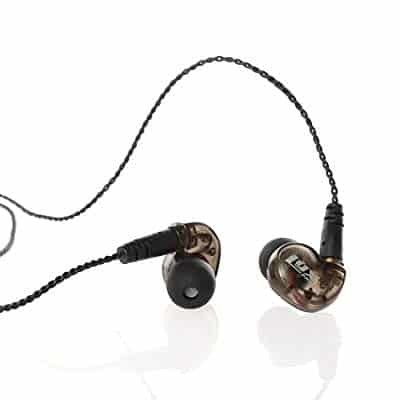 The ATH E40 in-ear monitors has an over-the-ear construction and flexible memory cables. The cables are detachable and replaceable, adding to the life of the monitors. The ear tips are made of silicone and come in four sizes – L, M, S, and XS. On the technical side, these monitors weigh only 0.3oz and uses the standard two-driver setup. The sensitivity is an impressive 107dB, while the frequency response is 20Hz to 20kHz. The E40 also features a gold-plated 3.5mm audio jack, as well as a 5.2” cable with A2DC connection. The ERP-10 is one of the champions of the entry-level class and one of my favorites from LyxPro. This affordable IEM set is a good option if you’re on a tight budget or want to test if IEMs are your thing. These affordable monitors are equipped with one 9mm driver per side. The ear caps are see-thru with Lyx logos on them. They also come with six pairs of ear tips – 3 silicone and 3 foam. They also feature 4’ detachable cables. The sensitivity is 94dB, while the impedance is fairly low at 16Ω. The frequency response is standard at 20Hz to 20kHz. Additionally, the ERP10 set features a carrying case and a 3.5mm to ¼” audio jack adapter. When shopping for in ear monitors as a drummer, you should always be guided by sound quality and the levels of noise isolation. You need to have a healthy blend of frequencies and considerate amounts of noise insulation, as drums tend to get really loud, especially at rock concerts. Once you’ve found a pair of in ear monitors that sound great, you also need to consider how comfortably they fit in your ears. You should be able to wear them for hours without experiencing any discomfort or fatigue. Consider the heat, the sweating, and all other factors that are commonly a part of your daily gigging routine. Your in ear monitors should be built to last. Because touring is quite a rigorous prospect, so your equipment needs to be able to withstand it all. In-ear monitors made for on-stage use come in two main variants – wired and wireless. While largely a matter of personal preference, you should consider the pros and cons that each option offers. Here are some of the basic characteristics of each approach. The wired models, as their name says, are connected to the body pack which is, in turn, connected to a mixer via cables. This means that wired IEM systems deliver greater reliability and consistency of performance. On the other hand, the wearer’s movement is limited by the length of the cable. Drummers, keyboard players, and other musicians and singers who do not move around the stage a lot can benefit greatly from wired IEMs. 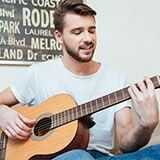 The wireless type is there primarily for musicians, actors, and singers who want or need complete freedom of movement. They are connected to a body pack through a cable which is connected to a mixing table via wireless connection. Sometimes the stage configuration makes it hard to have a wired system. That’s especially true for over-the-top elaborate stages with lots of moving parts (think Iron Maiden stages with airplanes, gallows, sword/guitar fights with a 10ft mascot). Like any other piece of gear, IEMs can range wildly in terms of price. You can get a pair of decent monitors for under $50 or you can spend over a grand for a top-of-the-line, professional set. While the affordable ones come with universal fit, you can order custom-molded ear-pieces with some of the high-end models. The choice here should depend on your needs. Universal-fit models make up the vast majority of commercially available IEM systems. They come with either foam or silicone earplugs (sometimes both types are included). 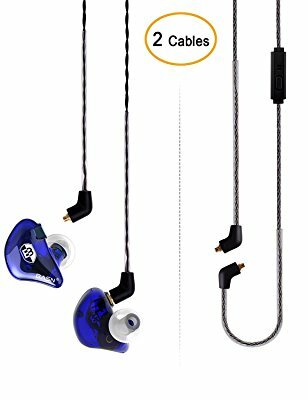 On the plus side, universal-fit IEM systems are more affordable and can feature a larger number of drivers for the same price. On the minus side, they might not be as comfortable as the custom ones. IEMs with custom-made earpieces are expensive and take some time to make. If you opt for a pair of these, you will first have to visit an audiologist to have them make molds of your ears. After that, the molds will be used to shape the plugs. Apart from superior comfort, custom-made IEMs offer additional customization possibilities. 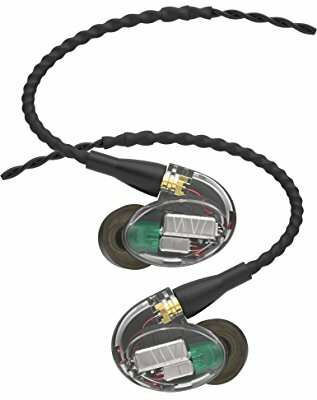 In-ear monitors can pack anywhere between one and eight drivers per monitor. This is partially dependent on the price and the quality of the drivers themselves (a set of monitors with two top-notch drivers per monitor will cost you more than a set of not-so-great three-driver system). As with your regular studio monitors or bookshelf/floor speakers, IEMs use additional drivers to lessen the load on each individual driver and allow them to work with a narrower frequency band. Models with one driver per monitor are generally among the most affordable. With them, the reproduction of the entire frequency range rests on said driver. While, no doubt, there are single drivers which do a great job, they can’t match the performance of a multi-driver setup. Those with two and three drivers are the most common. With one additional driver, you will have something resembling the typical woofer/tweeter kind of setup. Throw another one in, and you’ll have one driver for each major section of the frequency range. With all else equal, a three-way configuration will deliver more bass and improved clarity and detail across the board. When going through the technical specs of an IEM system, there are four main stats you should pay attention to. These are sensitivity, isolation, impedance, and frequency response. Let’s take a quick look at each of them. Oftentimes, in-ear monitors have to double as earplugs for musicians who wear them. That’s where isolation level comes in. Isolation is the level of outside noise which a particular set of monitors can filter out. It is measured in decibels (dB). The higher the number, the more protection you will get. Impedance is measured in ohms (Ω) and represents how resistant your IEMs are to the electric current. Models with higher impedance will draw less power from the source device and they’re easier to drive. Commercially available monitors have impedance rated at 10 to 30Ω. Sensitivity is measured in dB, but in contrast to isolation, it signifies how much volume a monitor will deliver at a certain power level. It is most commonly measured at 1W. A pair of earphones rated at 107dB sensitivity will play at 107dB when driven at 1W of power. It requires every doubling of power to deliver 3dB extra. So, you’d need 2W to driver those earphones to 110dB. Frequency response is the range of frequencies a given monitor can reproduce. Have in mind that the human ear can only register the range between 20Hz and 20kHz, and we tend to lose the ability to hear the highest frequencies with age. When all is said and done, you’ll probably end up with one of these around your ears. In ear monitors are an important piece of equipment and it can take quite some time to find that perfect pair. Hopefully, this article will put you on the right path.